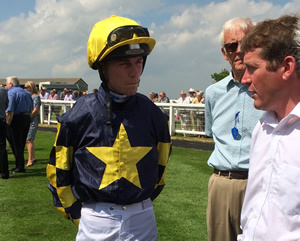 Do you wish to give a rather special person a deep involvement with racehorse ownership? Ownaracehorse is the perfect way of providing a season-long racehorse ownership experience with only a single, one-off up-front payment to make. Your lucky recipient will not need to spend anything extra, as everything is included in the up-front price of the racehorse or gift voucher. They will be treated as a VIP individual owner of the racehorse for the season and will benefit from a raft of ownership options. There are days at the races with guaranteed Owners Badges, personal visits to the stables and regular communications from their dedicated syndicate manager, by phone, email or Text Message (to suit them) to ensure the person receiving your ownership gift will have a thrilling and personal experience. Our special ownership gifts are often used as prizes in charitable auctions or raffles. We can also accommodate more than one person recieving the special share - as long as we are aware in advance. If you would like to select the racehorse yourself, and then provide your lucky recipient with the racehorse, then take a look at our 4% 'Private Service' deals. Simply choose a racehorse which you believe suits your recipient and then go through to pay. You can pay by Credit or Debit card, Paypal or with a single, one-off direct debit payment if you prefer. We will contact you after you have purchased to ensure we have all the details we need to set up the account for your recipient and personalise his Gift Pack. If you want to allow your recipient to be able to choose their own racehorses, then a Gift Voucher is the best option. You can purchase a voucher with a set face value, and your recipient can then use the voucher to purchase one of the Private Service deals. We recommend a £1,000 voucher as a minimum, as most of the Private Service deals will start at this minimum. Visit out Gift Voucher page and look for the 'Special Gifts' with the option to choose the voucher value. Once your recipient has chosen a racehorse, if the cost is slightly higher, you or they may pay the difference if they wish. If you would like to provide a 'Blank Cheque Choice' we can provide a gift where your recipient will have the choice of any private service share. In this instance we ask you to place a £1,000 payment on deposit with us by phone. Your recipient will be provided with a 'blank cheque' gift - which allows them to choose any private service racehorse - and once they choose their gift we make a balancing payment or refund any difference to your credit/debit card. We are always happy to discuss the options with the private service racehorses, so please feel free to call. We do not make use of any 'hard sell' tactics, as the racehorses sell themselves, so we're more than happy to discuss your requirements. Call us using the number in the top menu.